Many of us do extensive research before buying a mobile phone or car, booking a hotel, or even selecting a new restaurant. But when it comes to choosing a doctor, most of us do little more than get a word-of-mouth reference. Unfortunately, what often drives patient satisfaction and thus recommendation of a doctor is “bedside manners” – without regard to other aspects of good medical practice. As chief executive of a nonprofit hospital in Delhi, I have observed this in the context of maternity care. Gynaecologists are picked on reputation, and yet some of the most popular gynaecologists have undesirable outcomes such as high c section rates! A C Section is a major surgery and like all surgeries carries risk. A little while ago, the American College of Obstetricians and Gynecologists (ACOG) issued a statement that “pregnant women plan for vaginal birth unless there is a medical reason for a cesarean.” They pointed out that a caesarean delivery can increase the risk for infections, bladder and bowel injuries, and serious complications in future pregnancies. They noted that babies born vaginally have fewer respiratory problems. A few months ago I met a man whose wife was pregnant with their first child. This man was concerned about overuse of investigations and interventions in private obstetric practice. He had visited multiple hospitals to enquire about their caesarean rate. When I met him in a childbirth education class at our hospital, I congratulated him for being so proactive. But knowing about the performance of a gynaecologist or a hospital should not require such extraordinary effort. And yet there are many challenges to making such information available. Most hospitals don’t collect data on clinical outcomes – they may not have electronic health records or lack the manpower to manually collect the data. Gynaecologists and hospital administrators may also be hesitant to disclose quality-related data because of concerns about misuse by competitors or patients. But these concerns should not hold back efforts at promoting transparency if we want healthcare to become better and safer. Moreover, women and their families are also asking for accountability from their healthcare providers. Recently, a petition on Change.org gained well over 100,000 signatures asking doctors and hospitals to make mandatory disclosures of their c section rate. In 2014 we publicly disclosed the c section rate of our staff obstetrics and gynecology unit – becoming perhaps the first private hospital in India to do so. In the previous year – 2013 – our staff unit had delivered 561 babies with a caesarean rate of 40%. This rate was much above the 10-15% rate recommended by the World Health Organisation and the average rate in countries like Sweden (17%), UK (26%) or USA (33%). However, it was significantly lower than the 65% caesarean rate reported by a leading health insurance company in India for their claims. Because the risk of a c section is different for different groups of women – based on whether it is a first or subsequent delivery, whether prior deliveries were vaginal or by caesarean, whether the baby is in the breech or abnormal position, whether pregnancy has reached term (>37 weeks) and whether there are twins – it is more useful to look at caesarean rates for each of these groups separately. It is particularly insightful to look at the c section rate for low-risk first-birth women. This is the rate for first-time mothers who have crossed 37 weeks of gestation and have a single foetus in the correct head down position. 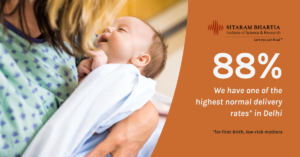 Our rate for this subgroup in 2013 was 30%; again this was high compared with exemplary hospitals such as the National Maternity Hospital in Ireland which has a rate of about 18% for the same group. While our c section rates in 2013 were lower than in prior years, we were unhappy that they were still high. But I am pleased to report that these rates have substantially declined – our total caesarean rate in 2016 was 18% and our low-risk first-birth caesarean rate was 12%. This compares very favourably to most private hospitals in Delhi where rates are typically in the 40-80% range! We believe that couples who want a positive birth experience should learn about criteria for selecting a top gynaecologist. The caesarean rate is a good starting point for evaluating your gynaecologist and letting her know about your preference for a normal delivery. *The term “normal delivery” is being used to indicate vaginal deliveries as is commonly understood by lay public. Authors note: This post was originally published in May 2014 and has been revised and updated.